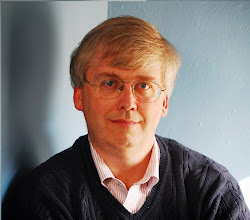 CONVERSABLE ECONOMIST: Fiscal Policy: How Has Conventional Wisdom Changed? Fiscal Policy: How Has Conventional Wisdom Changed? The last five years have brought economic policies that I would not have thought were even remotely possible if you had asked me in, say, mid-2007. The Federal Reserve and other central banks of high-income countries would push their policy-target interest rates to near-zero, and hold the rates there for years on end, while printing money to buy government debt? I wouldn't have believed it. The U.S. government would run budget deficits of 10.1% of GDP, 9.0% of GDP, 8.7% of GDP, and 7.0% of GDP in consecutive years, raising the debt/GDP ratio over that time from 40.5% in 2008 to 72.6% in 2012? I wouldn't have believed it. An IMF staff team led by Bernardin Akitoby offers some thoughts on how conventional wisdom about fiscal policy has change in the last five years in a September 2013 Policy Paper, "Reassessing the Role and Modalities of Fiscal Policy in Advanced Economies." What was the consensus view on fiscal policy back in the Stone Ages of 2007? The IMF report reminds us (as usual, footnotes and citations omitted): "The prevailing consensus before the crisis was that discretionary fiscal policy had a limited role to play in fighting recessions. The focus of fiscal policy in advanced economies was often on the achievement of medium- to long-run goals such as raising national saving, external rebalancing, and maintaining long-run fiscal and debt sustainability given looming demographic spending pressures. For the management of business cycle fluctuations, monetary policy was seen as the central macroeconomic policy tool. Fiscal contraction was sometimes recommended during periods of economic overheating as a means of supporting monetary policy, for example to take pressure off the exchange rate in the face of persistent capital inflows. However, during downturns, it was deemed that there was little reason to use another instrument beyond monetary policy." But when the Great Recession hit, this consensus wisdom went out the window in a hurry, not just in the U.S. economy but across the high-income countries of the world. 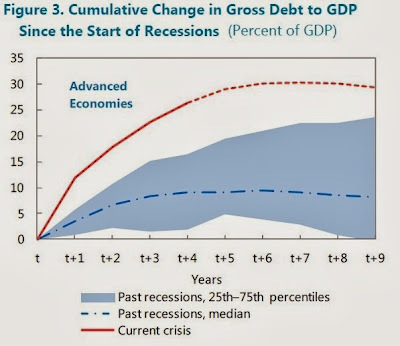 Here's a figure comparing the usual rise in the debt/GDP ratio after a recession (the blue dashed line) with what has actually happened in advanced economies since the recession (the red line). The U.S. economy, with a rise in the debt/GDP ratio of just over 30 percentage points, is just about on the average of how high-income countries have expanded their government debt since the Great Recession. estimated to exceed 50 percent of GDP ..." Official measurements of debt also don't take into account future promises for funding government programs, like providing support to the elderly. 3) In some "safe havens (Japan and the United States, for example), markets can tolerate much higher debt ratios than previously thought, at least for a time." 4) In other advanced economies, high government debt can lead to a harmful "soverign debt feedback loop." Within a given country, banks typically hold a lot of debt from the government of that same country. If the government piles up so much debt that it begins to look risky, then the banks of that country have a lot of assets that look risky. But if the government is to step in and rescue the banks, it will pile up more debt, which will make the banks look even riskier. See the recent history of Greece for how this story unfolds. government spending multipliers. Some recent studies suggest that spending multipliers are larger than revenue multipliers, while others reach the opposite conclusion ... "
6) Fiscal policy operates through automatic stabilizers and through discretionary policy. The automatic stabiliizers come into being because when an economy contracts, the reduction in economic activity automatically leads to lower tax revenues and to more people eligible for government spending support--without any new legislation. (For more detail on automatic stabilizers, see here.) Discretionary fiscal policy consists of the additional tax cuts or spending increases that required new legislation. 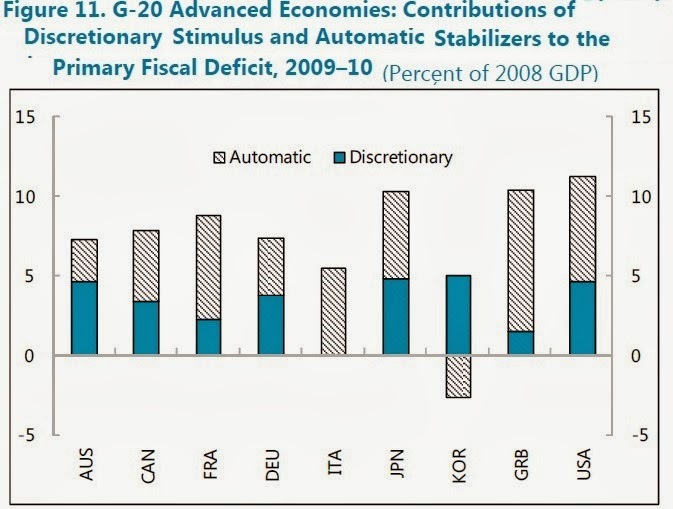 Here's the division of automatic and discretionary policy across some high-income countries. 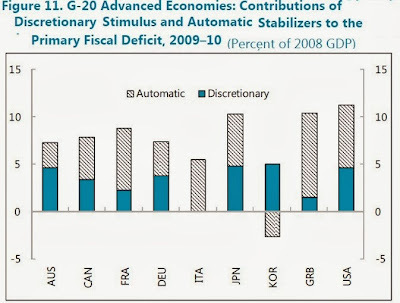 In the US, for example, automatic stabilizers were about 2/3 of the deficits in 2009-2010, and discretionary policy was the other third. 7) "The fundamental challenge facing policymakers today is to reduce deficits and debt levels in a way that ensures stability but is sufficiently supportive of short-term economic growth, employment, and equity. ...As mere promises to undertake fiscal adjustment later may not be persuasive, gradual consolidation needs to be anchored in a credible medium-term plan.